This floral medallion rug features a string of two gold, blue, and purple geometric flower-shaped medallions connected by some leafy shapes in the center. The negative space is filled with smaller weapons, namely the bright blue and red Stinger missiles, a rare motif in these rugs. The abstracted helicopters sit in the corner of each medallion. This rug is in excellent condition - except, painfully, for several small areas of moth damage. Please see photos and damage is reflected in price. 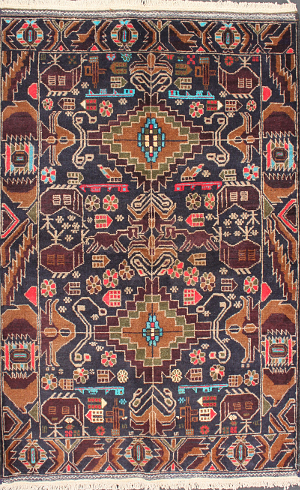 There are documented examples of this design dating to the first half of the 1980's, and the color, sheen, polish on back all indicate this is a rug of that group. This is an older war rug in perfect condition. There is some very minor bleeding of motif colors in the field. This is an older war rug in good condition. There is some minor tip fading in the dark blue and a small, dark mark 1inch wide by 9 inches long running diagonally up towards the bottom right helicopter. The weft threads are wool and the back of this rug is brinish-looking. Both of these are consistent with older rugs.